A greenway is a dedicated cycle & walking path linking places to one another. They may be newly planned and developed but usually they are redeveloped from existing routes such as old railway lines which are no longer in use. To date, there are very few dedicated 'greenways' in Ireland, but thankfully, this is changing as local people see their benefit for recreational use and their potential for developing eco-tourism in the region and for the safety of local and visiting cyclists and walkers alike. The Great Western Greenway is a gravel surfaced greenway suitable for cyclists, walkers and hikers. 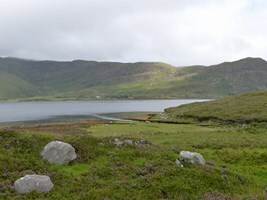 It extends for 42 kms from the town of Westport to within a kilometre of Achill Sound and passing through stunning countryside and the attractive villages of Newport and Mulranny along the way. I cycled the entire route and loved it! Click here for more information. The Great Southern Trail is a gravel surfaced greenway based on the route of the Limerick to Tralee/Fenit railway line which closed in the 1970's. Today, 40 kms of the route linking the towns of Rathkeale, Newcastle West and Abbeyfeale, Co. Limerick are open for walkers, hikers and cyclists. It passes through beautiful countryside. Click here for more information. The Déise Greenway is a 46 kms asphalt surface greenway in Co. Waterford based on the former Waterford city to Dungarvan railway line. It passes the scenic village of Kilmacthomas, two stone viaducts and a tunnel. Click here for more information. The Old Rail Trail is a 40 kms asphalt greenway from Mullingar to Athlone, towns in Co. Westmeath. 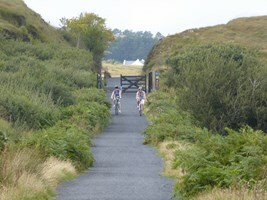 The Comber Greenway is an 11 kms asphalt greenway starting from Belfast, Co. Antrim and finishing in Comber, Co. Down. This greenway is a 34 kms asphalt surfaced cycle path which starts in Lisburn, Co. Down and finishes in Newtownabbey, Co. Antrim. This greenway is a 32 kms long asphalt surface starting from Portadown, Co. Armagh and finishes in Newry, Co. Down. Hopefully in the not too distant future, we will be able to admire and enjoy our beautiful landscapes as we walk or cycle in safety along connected greenways throughout the island of Ireland.